Question: What are these people doing? Is it A/ a new dance craze? B/ tai chi? C/ a dramatic Italian “talk to the hand” gesture? It’s all in the angle! 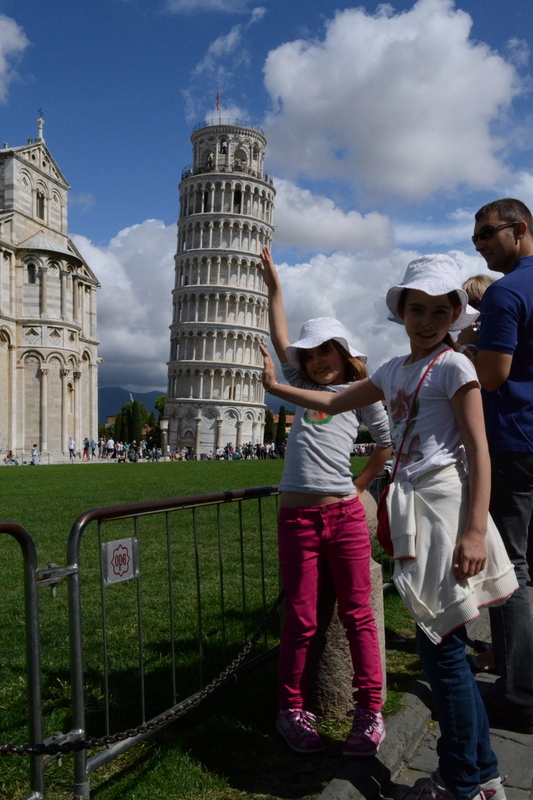 They’re doing what everyone does when they come to see the Leaning Tower of Pisa – getting the elusive “Yes, it really DOES look like I’m holding it up” shot. All over the Campo dei Miracoli they’re doing it…with their hands; laying on the grass and “holding” the tower up with their feet; or pretending to hug or kiss it, which looks weird from any angle. We jumped on a train for a day trip from Florence to perhaps one of the world’s, and definitely Italy’s, most famous sites. Strangely, there are no signs or arrows pointing in the direction of the tower at the train station, so luckily we had the info ready to go, and knew where to buy bus tickets headed for the Campo dei Miracoli (Field of Miracles). Seeing the tower, even wonkier than you’d imagine, in the field of green, right next to the cathedral and baptistry was surreal. How on earth is it still standing? And they’re letting people climb up there? Yelling “Niiiiiiigel…here I am!! !” from the top (thanks Contiki tours for that one). The tower took 200 years to complete, starting in 1185, and after many attempts to de-lean it (not too much of course…that’s why people are there), the top of the tower is now about 4 metres from where it would be if it was dead straight. We took a stand and decided not to do the climb. Well, it wasn’t actually a moral stand, but a financial one, as tickets are 18 euro per person, including little persons, and dropping AUS$100 to climb some stairs seemed a tad steep! So we happily lay in the sun, ate our pre-packed sandwiches, and admired the 55.86 metre high(on the tall side, 55.7 on the low) belltower before popping back on the bus and train, and heading home. Next Post Go with the Flo.